Inquiring minds are looking at the latest inflation reports from Japan for clues in the success or failure of Abenomics and prime minister Shinzu Abe's stated goal of two percent inflation. In December, Japanese inflation fell to 0.5% despite massive economic loosening, a 1% rise in industrial production, and a dip in the unemployment rate to 3.4%, the lowest since 1997. Today Reuters reports Japan January Inflation Seen Easing, Factory Output Up. Japan's core inflation is seen slowing for a sixth month in January while factory output is expected to rise, underlining the policy challenge facing the Bank of Japan as it strives to speed up economic growth and achieve its 2 percent price target. Stripping out the effects of a sale tax hike, the nation's core consumer price index (CPI) - excluding volatile fresh food but includes oil products - is forecast to have increased 0.3 percent year-on-year last month, a Reuters poll showed. The Bank of Japan is counting on exports to help offset the still-weak private consumption, and for weak oil prices to spur companies to spend more, helping the economy gather speed after last April's sales tax hike tipped it into recession. The nation's factory output is seen jumping 2.7 percent in January from the previous month, the poll showed. In December, output increased 0.8 percent on-month, after a 0.5 percent fall in November. Household spending is expected to have fallen 4.1 percent in January from a year earlier partly due to bad weather, down for a tenth straight month, the poll showed. And retail sales are set to fall an annual 1.3 percent last month, down for the first time in seven months. Household spending is down 10 straight months, partially die to bad weather. Is that a record streak of bad weather or what? Those are forecasts of course, but with expectations of a 4.1% decline in spending, I will go out on a limb and guess the report is at least in the ballpark. 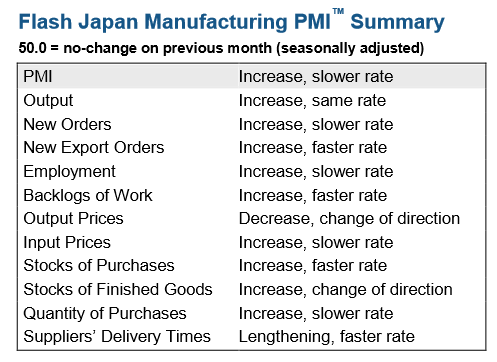 Markit claims the Japan Manufacturing PMI shows "solid production growth" but that is not my takeaway from looking at the data. The February "Flash" Manufacturing PMI is 51.5, down from 52.2 last month and is the slowest since July 2014. Manufacturing output is at 52.7, the same as last month, supposedly "solid" growth. Check out the summary. The big positive is an increase in export orders but the chart does not look too impressive. Every country wants a weaker currency to boost exports relative to imports. It's mathematically impossible. If Japan succeeds dramatically, it will be at the expense of some other country. Take your pick: USA, Germany, China. Recall that exports add to GDP while imports subtract from GDP. If Japan is once again exporting more cars and technology to the US, and if the US is exporting less due to the rising value of the US dollar, where does that put US GDP? And what about the possibility China enters a beggar-thy-neighbor scheme to lower the yuan to compete with Japan. None of this sits very pretty for upcoming US GDP reports or for various trade retaliations. More than likely, such thoughts give the Fed too much credit because history shows they are totally clueless. Regardless, Japan is once again on the verge of price deflation in spite of Abenomics. That's a good thing actually for the Japanese consumer, but few see it that way.